East Riding Leisure, Bridlington is a £25 million development replacing the original building whose fabric and infrastructure was deteriorating to such a level that the ongoing maintenance requirements dictated the site was no longer sustainable as a going concern. 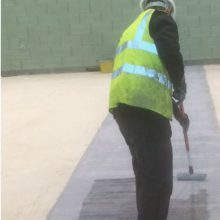 During construction an issue was discovered with the recently installed Sports Hall slab, with several sections of the slab requiring additional strengthening to relieve hogging stresses in excess of reinforcing bar installed in the slab. 1) Hydro-demolish areas of the slab to a depth of 80mm, installation of new steel with a minimum of 30mm cover, and concrete reinstatement to match the existing grade strength. 2) Carbon fibre strengthening in lieu of traditional reinforcement to the top surface of the recently constructed concrete slab. Specialist UK Restorations employed the services of Curtins Consulting to produce a series of scheme designs to suit availability/cost effectiveness of Sika products, and a detailed design of one product for use in lieu of proposed traditional H8 reinforcing bar. We were awarded the contract due to both the cost effective nature of the proposed solution, and also the non-intrusive nature which allowed other trades to continue working throughout. The specified product was SikaWrap-301C which is a unidirectional woven carbon fibre fabric. All works were successfully complete within a 2 week window to ensure there was no impact on the critical path. SUKR were appointed by Jacobs Engineering to carry out remedial works to an existing load bearing reinforced concrete column at Kimberly-Clark’s Barrow Mill factory. The cracking was shown to pass through the column and was deemed a H&S risk in need of urgent repair. The first stage of the repair was to restore the structural integrity to the area surrounding the damaged column. This was achieved in two stages, firstly we installed 2 steel brackets either side of the column at first floor level. The second stage was to open up two areas of brickwork either side of the column, allowing us to install RSJ’s and supporting Heavy Duty Acrow Props/Strongboys. 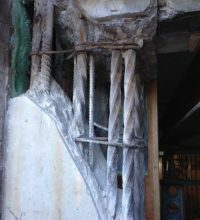 The extent of the concrete removal highlighted the poor condition of the column, and 11 days after completion of the reinstatement, a cube test result returned with a compressive strength of 64.5N/mm2. Specialist UK Restorations were appointed by BAM Nuttall to address a number of issues affecting the existing reinforced concrete Final Settlement Tanks (FST’s) at Bran Sands Effluent Treatment Works, for Northumbrian Water Limited. Vertical cracks were present through the full section of the FST launder channel walls at regular intervals, and these cracks in conjunction with the abrasion of the scraper mechanism wheel, had resulted in spalling and wearing away of the top surface of the launder channel concrete walls. Specialist UK Restorations, in conjunction with Sika Ltd, produced a full material specification to alleviate the full list of defects as highlighted by the structural report prepared by AMEC. In order to allow the concrete repair works to be undertaken we first used abrasive blast cleaning to remove the existing epoxy tar coating. All damaged concrete was then cut back and removed down to a sound base. As per the specification we carried out in the initial repairs by applying Sika MonoTop-610, which acts as a bonding bridge for the MonoTop concrete repair mortars. Sika MonoTop-615 high build repair and re-profiling mortar was then trowel applied, prior to applying Sika MonoTop-620 cementitious smoothing coat/leveling mortar and pore sealer. Each area being reinstated back to its original line and level incorporating any surface features that were previously present e.g. rebates, chamfers and the like. Due to the chemical structure of the effluent housed in the fully restored tanks, SUKR also applied Sika Poxitar F, a heavy duty protective coating for steel and concrete structures. Upon completion of the remedial works, SUKR had as much as is reasonably possible, returned the tanks to their original design condition. Providing a smooth finish to allow the scraper wheel to travel along, but also be resistant to abrasion from the action of the scraper wheel. Heysham Power Station is a nuclear power station located in Heysham, Lancashire, operated by EDF Energy. The site is divided into two separately-managed stations, Heysham 1 and Heysham 2, both of the advanced gas-cooled reactor (AGR) type, with two reactors each. 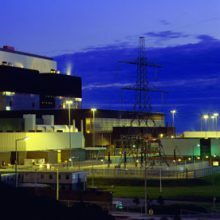 Heysham is the only site in the UK to have two operating nuclear power stations. SUKR were appointed via Cofely Workplace Solutions to undertake the replacement of Pre-Cast Concrete Planks within the Turbine Hall Basement Steam Rooms of Heysham 2. A 200mm thick in-situ concrete cover to the Turbine Hall Dirty Drains trench, which provides a 1 hour fire barrier, had degraded, with a temporary fire barrier having been installed above the degraded barrier. The project consisted of removing the existing temporary barriers and the degraded existing in-situ concrete barrier prior to replacing both with a new cover of Pre-Cast Concrete Planks. 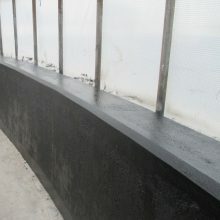 The new Pre-Cast Concrete Planks were supplied by SUKR to the specification and mix design parameters provided, and finished with a High Build Quick Drying Epoxy Finish. Due to the sensitive location of the works, all SUKR operatives went through the rigorous security clearance procedures and detailed induction day prior to undertaking any works. The demanding nature of the works, and the extreme temperatures within the turbine Hall Basement Steam Rooms, demanded that Health & Safety measures of the highest standards were implemented by all parties. Such was the success of the project, SUKR were invited to a ‘best practice’ review meeting with both EDF and Cofely Workplace Solutions representatives to look at how they could replicate this on all schemes going forward. Specialist UK Restorations were appointed Principal Contractor on a balcony repair and refurbishment scheme on behalf of Stockport Homes ltd. Stockport Homes is a limited company that exists to manage the housing stock owned by Stockport Metropolitan Borough Council. Stockport Homes undertook structural investigations at seven low-medium rise flats which highlighted numerous defects in respect of the concrete canopies and balconies. The balconies had a thin asphalt coating that continued into the drains and was also coved up the wall. The asphalt had begun to fail and this could clearly be seen around the perimeter coving and the drains, with the asphalt apparently leaking water due to localised evidence of steel corrosion to the balcony soffits. SUKR were appointed to carry out, in no particular order, core holes through the balcony slabs prior to installing new and improved drainage, concrete repairs to the soffit, face and balcony floor, anti-carbonation coating to soffits (balconies cast in-situ), through coloured silicone render to soffits (pre cast panel balconies), balcony coating/waterproofing. SUKR specified an advanced concrete repair system from Sika, including the MonoTop repair system, anti-carbonation coating SikaGard 675W, with the fast cure balcony coating Sikafloor-415 for the recoating to the balconies. 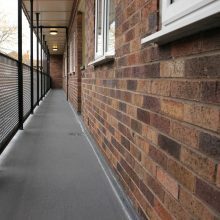 Not only did this provide a cost effective, reliable and efficient solution, the quick curing abilities of the Sikafloor-415 system enabled the residents to remain in-situ throughout the full duration of the programme. On behalf of Wrexham Council, Specialist UK Restorations undertook concrete condition surveys including testing for carbonation depths and chloride content as per recommendation of EN1504. 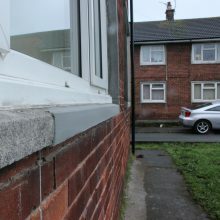 A large number of social housing properties had steel reinforced concrete window cills and concrete slabs as roof canopies, and over the years the steel reinforcement had corroded subsequently pushing the face of the cills away. Subsequent to the test results and our proposed repair and protection strategy, SUKR were appointed Principal Contractor on a 2 year framework agreement working directly for Wrexham Council. The framework was due to be run until December 2015, after this we were awarded an extension to 2018. The specification consists of Sika MonoTop 610 bonding primer, Sika MonoTop 615 repair mortar, Sika Ferrogard 903+ corrosion inhibitor, Sikagard 550W Elastic protective coating, with all construction joints being treated with Sika Hyflex 250. 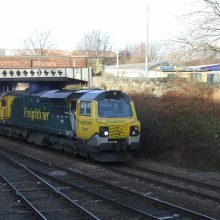 Beza Street Bridge is a three span structure carrying Beza Street over the railway line between Leeds and Castleford. The bridge comprises a filler joist deck supported on masonry abutments and steel trestle intermediate piers. The 8no. steel trestles are bolted to reinforced concrete plinths. Visual/detailed examinations of the structure had identified significant areas of defective concrete (cracking/spalling/delamination) to the plinths of the intermediate piers. The principal cause of the concrete defects was identified as excessive chloride contamination due to de-icing salts penetrating through the deck slab joints and then contaminating the concrete plinths. As a Sika approved company, we were appointed by AMCO Rail to install the specified concrete repair and corrosion inhibitor system to repair the ageing structure with minimal disruption whilst ensuring the highest standards of safety for users of its single lane carriageway and railway line below. Inline with the detailed specification we carried out the initial repairs by applying a layer of Sika MonoTop-610 to inhibit corrosion and improve the lifespan of steel reinforcements, prior to the application of Sika MonoTop-615 high build repair and re-proofing mortar. With good resistance to water and chloride Penetration, this complete system provides long term protection to the concrete structure. To manage on-going corrosion, we then embedded Sika Galvanshield Sacrificial Anodes to provide integral long term protection. Utilising a team of skilled applicators, the full application was complete within a four week period – minimising disruption to road users and rail services by working overnight between 10pm and 6am. Due to the successful installation of the specified concrete repair system, the structure remains fully protected from corrosion for many years to come.